This charming 2 bedroom 2 bath unit is located in the gated community of Poolside Villas; a small 30 unit community which allows a more peaceful, laid back vacation. Poolside Villas is on Holiday Isle at Norriego Point. This unit has a queen bed, full size bed, sleeper sofa, and upgraded appliances. TV's in the living room, master bedroom and guest bedroom (guest bedroom is DVD only- no cable) The balcony features views of the Destin harbor where you can sit and enjoy after a long beach day. 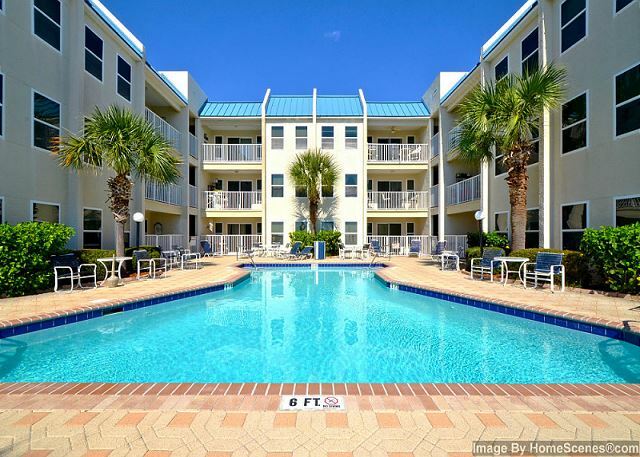 This complex is a great location for snorkeling, fishing, or watching the boats enter the Gulf and also is nearby to all of Destin's exciting activities. There are grills and a public pool for your convenience; as well as a pathway that leads you down the white sandy beaches of the emerald coast. Public gulf beach access is just 100 yards away or enjoy the water at the East Pass. This is an all-around great condo for your beach vacation! The condo was clean and just as described. It is right on the beach and has a nice pool for the price. Everyone I coordinated with was amazing!! The property itself was nice and convenient to beach. Our unit was clean but outdated and the mattress in master was horrible. A lot of traffic on beach with boats dropping people off. The rental was very was perfect for my family... great location... would definitely go back and would recommend anyone I know to stay there! We had a great time. Nice quiet place. Not crowded at all. Nice place to stay. We enjoyed our time at Poolside Villas. The location was great and we would come back again. The property was nice and clean. It was a wonderful experience all in all. Everything was absolutely perfect. The elavator was not working at times which made it hard to unload to the 3rd floor. Can't wait to book out next stay! I've stayed at approximately 5 different condos at Poolside Villas, but this one was by far cleanest and nicely decorated out of all of them. It rained almost the whole weekend we were there, but we felt so at home that we didn't mind just hanging out at the condo. You just can't beat the location for the price! Brenda Hegwood from petal ms. Yes we did enjoy our stay there. It was very clean , spacious and comfortable. The only problem we had was the bed in the master room. It had a huge dip on one side. The location was great. This was the best experience we have had, and we have stayed in Glorida for years! The rental company went above and beyond our expectations. Highly recommend them!!! Very great experience....nice spacious rooms and very home like feel to the entire property.. Even though it was rainy and overcast, I was able to take my first break from work and continuos education, working towards a PhD. The room provided comfort that was a get away from normal society and I was glad that I had some old movies to watch during the rain storm. Poolside Villa was located near shopping areas to conveniently make it possible to purchase all needed supplies for a weekend stay before unlocking the front door and entering a beach escape. Can't wait to once again experience the same vacation in the future.